Tim Muriello Go Pronto is a preparation containing optimally composed set of essential, exogenous amino acids (EAA + BCAA) with the high content of anabolic leucine, which is essential to build strong muscle mass. Additionally, there are ingredients supporting digestion in the preparation (bromelain and xylooligosaccharide), electrolytes (sodium and potassium) derived from the best, natural sources and magnesium (in the form of glycerophosphate and citrate), which i.a. help to maintain proper water-electrolyte balance, get rid of troublesome muscle cramps and improve physical efficiency of the organism. The presence of foam in a shaker during mixing is a very common phenomenon in case of amino acid preparations, which may result from i.a. the presence of a large amount of leucine. As the producer ensures - the formula applied in the preparation minimizes the volume of foam and at the same time it allows to preserve a large content of leucine. People who want to relish the taste of protein shake will not be disappointed, as the product perfectly pampers the taste buds of even the greatest connoisseurs, as the taste of the preparation is not too sweet and it does not lose the aroma character. The preparation provides the full range of exogenous amino acids (EAA, Essential Amino Acids), thanks to which it effectively initiates anabolic processes. In their composition there are the so-called branched-chain amino acids, i.e. BCAA. Contrary to endogenous amino acids (NEAA), EAA are not synthesized in the organism, therefore they need to be provided from outside, e.g. in the form of the supplements or food rich in these amino acids. Exogenous amino acids are essential to build muscle tissue. The most important process taking place there, which causes the increase of muscle mass is the biosynthesis of proteins, which becomes initiated by leucin - an amino acid from the group of BCAA. Without it the whole “machine” which is responsible for the production of new and stronger muscle fibers cannot start its work. 5 g of leucin - such an amount offered in the supplement considerably facilitates the growth of muscle mass and “boosts” it on the molecular level. The role of these amino acids is not limited only to the anabolic activity. These amino acids also play a range of other functions, important for the organism. By undergoing modifications in the liver, it is possible to obtain metabolic fuel in the form of glucose or fatty acids. In other tissues, they are precursors for hormones (i.a. adrenaline, noradrenaline), creatine, nucleic acids, nitric oxide and they also improve the functioning of various systems. There is also L-glutamine in the supplement, which despite the fact that it does not belong to exogenous amino acids, plays an important function in protecting muscles from catabolism. Its deficiency in the organism “forces” the organism to break down muscle proteins, rich in this amino acid. Providing the organism with the optimal dose of L-glutamine allows to maintain proper nitrogen balance, which noticeably improves the growth of muscle mass in a much shorter time, at the same time increasing strength during training session and recovery between them. Not without a reason there are also ingredients supporting digestive processes in the product - bromelain and xylooligosaccharide. Bromelain is a compound isolated from pineapple, an enzyme from the group of proteases which plays a supportive role in the digestion of proteins, preventing their storage in the digestive system. Xylooligosaccharide is distinguished by prebiotic properties, inhibits the occurrence of bloating and supports the development of the “beneficial” bacterial flora. Both these ingredients ensure well-being, prevent the occurrence of diarrheas, indigestion, stomachaches and support the growth of the “beneficial” intestinal flora, which is especially important in case of supplementing a lot of proteins. Adding these ingredients to the supplement may help to decrease all side effects of increased protein supply in a diet and allows to enjoy the benefits in the form of maximal increase of muscle mass. Electrolytes enable i.a. maintaining proper water-electrolyte balance, help to get rid of persistent muscle cramps and improve physical efficiency of the organism, therefore the most important of them (sodium, potassium and calcium) also appear in the preparation. Sodium and potassium play a range of important functions in the organism, but the most important of them is maintaining proper water-electrolyte balance. Sodium cation is located in the extracellular liquid, while potassium cation inside cells - their proper concentration guarantees well-being and proper tissue hydration - including muscles, which may contribute to the feeling of the so-called “muscle pump”. Designers of Go Pronto took care to make the source of electrolytes - sodium and potassium - natural and of highest quality, therefore they were isolated from pink Himalayan salt and coconut water, i.e. the products, the pro-health properties of which are appreciated all around the world. Magnesium - it is mainly responsible for neurotransmission in neuromuscular junction, as it has antagonist effect on calcium cations, which enable the secretion of this neurotransmitter, related to proper functioning of muscles. Moreover, magnesium cation takes part in regulating energy availability for muscles, as it enables obtaining ATP in the process of glycolysis, the proper amount of which is reflected in strength results of working muscles. Deficiency of magnesium ions is often known to sportsmen who perform intensive training, as it is most often encountered in the form of excessive muscle cramps. Its supplementation ensures protection from their occurrence, which indirectly contributes to performing more intensive trainings. 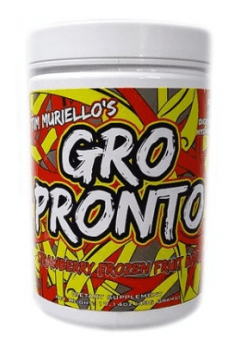 To sum up, Tim Muriello Go Pronto is a complex of perfectly selected ingredients, which have multidirectional activity - they support digestion and at the same time enable the provision of amino acids, essential for the synthesis of muscle proteins and they also influence proper state of hydration of muscle tissue. The supplement is addressed to people, who value high-quality supplements, ensuring maximization of muscle mass growth. Mix 1 scoop per 12 ounces of water for best taste. Due to the high level of Leucine, GOPRONTO will mix best in a shaker cup or any drinking device that will allow you to shake and mix vigorously. Do not exceed 4 scoops in any given 24 hour period. GOPRONTO can be consumed any time of day, but most beneficial during or immediately after exercise. The supplement is also addressed to people, who regardless of the kind of training, want to maximize muscle mass increase or protect muscle tissue from catabolism. The complex of ingredients is especially recommended to people who perform strength training, who would like to take care of even better recovery of muscle fibers. Additionally, I recommend supplementation with creatine. To obtain better taste, mix 1 scoop with a glass of milk. Tim Muriello is the founder and producer of the line Spazmatic Supplements. His offer includes pre-workouts, prohormones, amino acids, as well as sports clothing and accessories. Tim Muriello has been specializing with broadly defined sport and dietary supplements for years. He worked with the most prominent people of the fitness world, and now he is collaborating with other producers, as a product reviewer, adviser, and educator. Tim Muriello's Spazmatic Supplements products do not contain any proprietary blends, but only a clear composition with carefully selected substances at appropriate doses. These are original supplements personally composed by Tim Muriello, based on his many years’ experience and knowledge. In addition to the highest efficiency, the products are also characterized by an excellent taste. These are the high-end products designed by an athlete for athletes. Magnesium glycerophosphate - it is used in supplementation as the source of an essential microelement in the diet of humans, magnesium. It is characterized by high bioavailability, thanks to which it constitutes an effective form of complementing the supply of this element. Magnesium deficiencies are mainly associated with painful cramps of muscles. It may indeed be the symptom of deficiencies of this element, which take place relatively often due to the considerable need of the organism for this element and at the same time – its limited supply in a diet. Magnesium ions condition proper nerve transmission, positively influencing the efficiency of neuromotor control and the functions of the nervous system. Apart from this, magnesium is an important building element of the organism. It positively influences the development and mechanical endurance of bones and epithelial cells. Magnesium deficiencies are related to the development of tooth decay, increased fragility of bones and hair loss. It is also indicated that proper supply of magnesium is incredibly important in order to maintain optimal mental condition. Its deficiencies are related to the occurrence of depression and supplementation shows positive influence on the stabilization of emotional state in people with such disorders. The conditions that require magnesium supplementation are the application of hormonal contraception, diuretic drugs, chronic stress and frequent alcohol consumption.